In this paragraph we will provide process designer with a set of topics that need to be addressed when considering the OEE during the design of a new production system. A proper assessment a-priori of the OEE, and the consequent design and sizing of the system demand process designer to consider a variety of complex factors, all related with OEE. It is important to notice that OEE measures not only the internal losses of efficiency, but is also detects time losses due to external time losses (par.2.1, par.2.2). Hence, in this paragraph we will firstly define analytically the OEE. Secondly we will investigate, through the analysis of relevant literature, the relation between the OEE of single equipment and the OEE of the production system as a set of interconnected equipments. Then we will describe how different time losses categories, of an equipment, affect both the OEE of the equipment and the OEE of the Whole system. Finally we will debate how OEE need to be considered with different perspective in accordance to factors as ways to realize the production and plant layout. OEE is formulated as a function of a number of mutually exclusive components, such as availability efficiency, performance efficiency, and quality efficiency in order to quantify various types of productivity losses. OEE is a value variable from 0 to 100%. An high value of OEE indicates that machine is operating close to its maximum efficiency. Although the OEE does not diagnose a specific reason why a machine is not running as efficiently as possible, it does give some insight into the reason1. It is therefore possible to analyze these areas to determine where the lack of efficiency is occurring: breakdown, set-up and adjustment, idling and minor storage, reduced speed, and quality defect and rework. In literature exist a meaningful set of time losses classification related to the three reported efficiencies (availability, performance and quality). Grando et al. for example provided a meaningful and comprehensive classification of the time-losses that affect a single equipment, considering its interaction in the interaction system. Waters et al. and Chase et al. 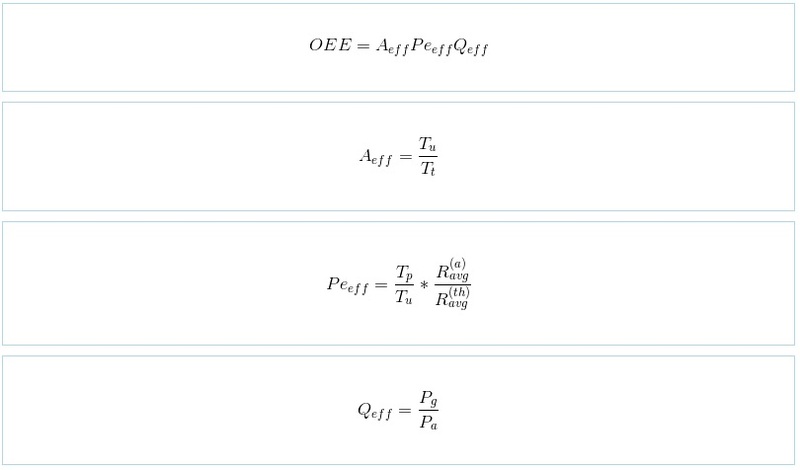 showed a variety of acknowledged possible efficiency losses schemes, while Nakajima defined the most acknowledged classification of the “6 big losses”. Table 3.4 summarizes briefly each factor. Availability efficiency. It considers failure and maintenance downtime and time devoted to indirect production task (e.g. set up, changeovers). Quality efficiency. It consider loss of production caused by scraps and rework. Equipment uptime during the Tt. It is lower that Tt because of failure, maintenance and set up. Equipment production time. It is lower than Tt because of minor stoppages, resets, adjustments following changeovers. Average actual processing rate for equipment in production for actual product output. It is lower than theoretical (R(th)avg) because of speed/production rate slowdowns. Average theoretical processing rate for actual product output. Good product output from equipment during Tt. Actual product units processed by equipment during Tt. We assume that for each product rework the same cycle time is requested. The OEE analysis, if based on single equipment data, is not sufficient, since no machine is isolated in a factory, but operates in a linked and complex environment9. A set of inter-dependent relations between two or more equipments of a production system generally exists, which leads to the propagation of availability, performance and quality losses throughout the system. Mutual influence between two consecutive stations occurs even if both stations are working ideally. In fact if two consecutive stations (e.g. station A and station B) present different cycle times, the faster station (eg. Station A = 100 pcs/hour) need to reduce/stop its production rate in accordance with the other station production rate (e.g. Station B = 80 pcs/hour). In this case, the detected OEE of station A would be 80%, even if any efficiency loss occurs. This losses propagation is due to the unbalanced cycle time. Therefore, when considering the OEE of equipment in a given manufacturing system, the measured OEE is always the performance of the equipment within the specific system. This leads to practical consequence for the design of the system itself. A comprehensive analysis of the production system performance can be reached by extending the concept of OEE, as the performance of individual equipment, up to factory level. In this sense OEE metric is well accepted as an effective measure of manufacturing performance not only for single machine but also for the whole production system and it is known as Overall Throughput Effectiveness OTE. We refer to OTE as the OEE of the whole production system. Equipment OEE, as the OEE of the single equipment, which measures the performance of the equipment in the given production system. System OEE (or OTE), which is the performance of the whole system and can be defined as the performance of the bottleneck equipment in the given production system. The System OEE measures the systemic performance of a manufacturing system (productive line, floor, factory) which combines activities, relationships between different machines and processes, integrating information, decisions and actions across many independents systems and subsystem1. For its optimization it is necessary to improve coordinately many interdependent activities. This will also increase the focus on the plant-wide picture. Figure 3.3clarify which is the difference between Equipment OEE and System OEE, showing how the performance of each equipment affects and is affected by the performances of the other connected equipments. These time losses propagation result on a Overall System OEE. Considering the Figure 3.3 we can indeed argue that given a set of i=1,..,n equipments, OEEi of the i th equipment depends on the process in which it has been introduced, due to the availability, performance and quality losses propagation. The OEEn computed in Table 3.5 is the OEE of nth station introduced in the production system (the OEEn when n is in the system and it is influenced by the performance of other n-1 equipments). According to Table 3.5 the only measure of OEEn is a measure of the performance of the whole system (OTE). This is true because performance data on n are gathered when the station n is already working in the system with the other n-1 station and, therefore, its performance is affected from the performance of the other n-1 prior stations. This means that the model proposed by Huang, could be used only when the system exists and it is running, so OEEn could be directly measured on field. But during system design, when only technical data of single equipment are known, the same formulation in Table 3.5 can’t be used, since without information on the system OEEn in unknown a-priori. Hence, in this case the Table 3.5 couldn’t provide a correct value of OTE.